Pierre Bourdieu: In Algeria. Testimonies of Uprooting. The exchange between Camera Austria, Fondation Bourdieu and the French sociologist Pierre Bourdieu between 2000 and 2002 led to a comprehensive project: he entrusted his entire archive of photographs taken during his fieldwork in Algeria between the years of 1958 and 1961 to Camera Austria with the intention of exhibiting and publishing these photographs for the first time. 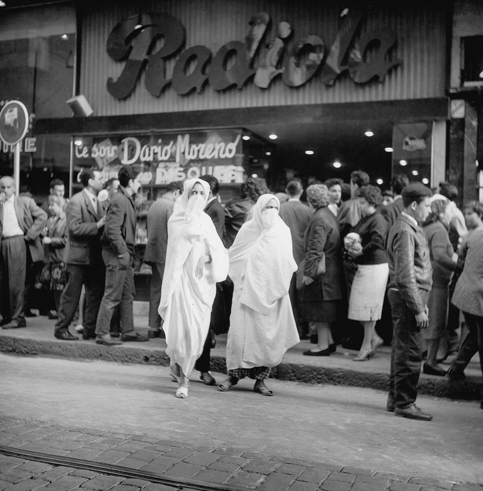 The photographs that Pierre Bourdieu took in the course of his ethnological and sociological research work during the Algerian war of liberation allow a new angle on his view of the social world. These photographs, which lay buried in dusty boxes for fifty years, testify to a journey of initiation and a profound conversion that served as the starting point of an extraordinary scientific and intellectual trajectory. Having the feeling of being left empty-handed in view of this vast social laboratory in a state of war, which made field research a veritable adventure, Bourdieu threw himself with total commitment into his work, experimenting, testing and using all possible ethnological and sociological research techniques. As a firm opponent of French colonialism and military oppression, Bourdieu saw his research in the compass of a radical political and committed approach: he wanted to bear witness to all that he saw, to understand a totally unsettled social world rife with contradictions and anachronisms. Text exhibition Pierre Bourdieu: In Algeria. Testimonies of Uprooting. was shown at Institut du Monde Arabe in Paris (FR) and at Camera Austria in Graz in 2003. After numerous international presentations at Círculo de Bellas Artes, Madrid (ES), Jeu de Paume / Château de Tours, Tours (FR) and parallel to documenta 14 at the Institut Français de Grèce, Athens (GR) among others, the exhibition will be shown in Sweden at Landskrona Foto in the frame of Landskrona Foto Festival.